If you live on the island but haven't noticed the huge Ferris wheel on top of Mihama's hottest shopping center, then you must not get out much. If you've seen it but haven't yet ridden on it, you are really missing out. If you've been on it before, you definitely should consider doing it again. Taking a ride on the Ferris wheel in the daytime, at sunset and at night are three completely different and incredible experiences, with each offering its own spectacular view of the island. 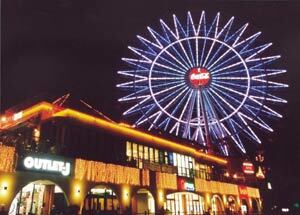 As an added incentive to get you up there, selected stores and restaurants in Carnival Park Mihama are giving out free Ferris wheel tickets. Those on the first floor are Indio, Uni, Suwan, David-son, Ca-boo, Outlet-J, Breeze, Ramanaya, Ride Hot and Foxy; on the second-floor are Ichigen-ya, Duo, Karin (Pasta, Japanese, Curry, Steak), Bull Dog, Farmers Ice, Ururu and Buppie. Each place of business has its own conditions for giving out free tickets; just ask the staff how to qualify for this great deal. Don't forget that the ticket is only valid for the day you receive it. So why not enjoy shopping and/or a nice meal and top it off with a free, romantic ride to see some gorgeous scenery? Sounds like a good idea to me!